I’m a big fan of webinars. They’ve been central to the growth strategy at Imagine for the last seven years, and they’re a core part of The Demand Cultivator™ process that we provide clients. Excellent tools to attract new people into your funnel. Among the best conversion opportunities out there. A primary opportunity to move prospects that are stuck in the pipeline. Great tools to use by salespeople attempting to get into the right doors. Unfortunately a lot of small and mid-market (SME) B2B companies completely overlook webinars as a lead generation or opportunity conversion vehicle. When I begin talking with clients about webinars, I’m often reminded of Jerry Seinfeld’s bit that people are more afraid of public speaking than they are of death. The truth is that anyone can use webinars successfully. Here are four key points you need to consider when using webinars as a part of your sales and marketing mix. 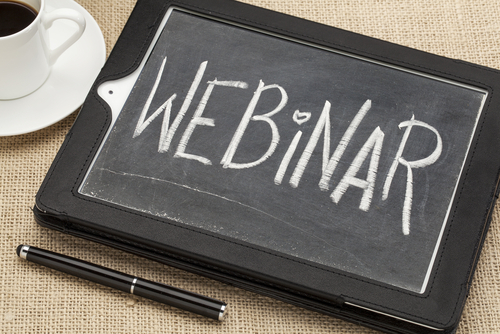 There are basically two types of webinars that are effective in the sales process. If you’re early in the funnel, your webinar should be focused on highlighting important problems that you solve. This focus creates what I like to call a “hole of knowledge.” Your goal in these webinars is to challenge and provoke your attendees thinking and to change the paradigm they’re operating from. If you’re in the late funnel, the focus should be on highlighting solutions and your capabilities. This is where demos are effective as well. A critical mistake to avoid is focusing on a late funnel webinar early in the funnel. A solutions oriented webinar fills a “hole of knowledge,” and if the pain/problem hasn’t been clearly established, it actually has the effect of reducing the perceived need to act. You have a choice of whether you want to present your webinar live or if you want to record it and present it “on-demand.” If you’re just starting out I recommend you go with on-demand, as it takes a lot of the pressure off of your presentation (you can edit the program after its done to fix any mistakes or missteps), as well as on promotion. This is probably the most frequent question I’m asked. The answer is that your webinar should be as long as it needs to be. I’ve seen effective webinars as short as 5 minutes (see video) and as long as two hours (which for most, admittedly, is too long). Short (5 – 10 minutes): This is a good length when the webinar is geared to achieve a specific objective. You’d only want to use this option when the webinar is prerecorded and people can watch it at their leisure. This length is designed for you to deliver an important sales message, with a clear call to action. Medium (25 – 40 minutes): This tends to be a sweet spot for people who are just starting out, and is highly effective for early funnel programs. This is enough time to make your point clearly, without having to risk getting in the weeds. Longer (50-60 minutes): While we do a number of medium length programs, our longer programs yield the best direct results (ie direct conversions). When you go to this length, you need to be comfortable with the format and you must make sure that you’ve got the content to keep them engaged. One other point on length, the longer the webinar, the more slides you want to use per minute. There’s nothing worse than a 60 minute webinar where the presenter stays on the same slide for 5 minutes (or longer). The goal should be no more than a minute per slide. The most important thing to remember when presenting webinars is that you are telling a story, and the program needs to be structured as such. Stories have a plot, conflict and resolution. Your webinar needs to have those as well. Vision: Share the picture of success. What’s the goal everyone wants that’s leading them to spend time watching this webinar? Obstacle: If achieving the goal were easy, there would be no need to watch the webinar. This is where you focus on the problem, and the problem behind the problem. This is where the provocation occurs. If you’re doing an early funnel program, this is the most important portion of your webinar. Transformation: Okay, so achieving the goal is hard. Share the path that the viewer needs to take to overcome the obstacle and achieve the vision. Action: Leave with action steps. Don’t forget to tell them what they need to do to start making progress.